The Tatuaje Wolf is a part of Tatuaje’s Pudgy Monsters series that was released in mid 2014. This is the second sampler series released based on Tatuaje’s Monsters Series – a cigar released on an annual basis that pays homage to a different monster / horror movie character. In 2012, the Tatuaje Little Monsters series was released which provided smaller and thinner versions of the original Monster Series releases. While there are two all new blends in the Pudgy Monsters Series, the Tatuaje Chuck and Tatuaje Tiff, the remainder of the set provides another set of smaller monsters, but these have larger ring gauges (in most cases the same ring gauge as the original Monsters Series and same length as the Little Monsters). Today, we take a look at the Tatuaje Wolf. 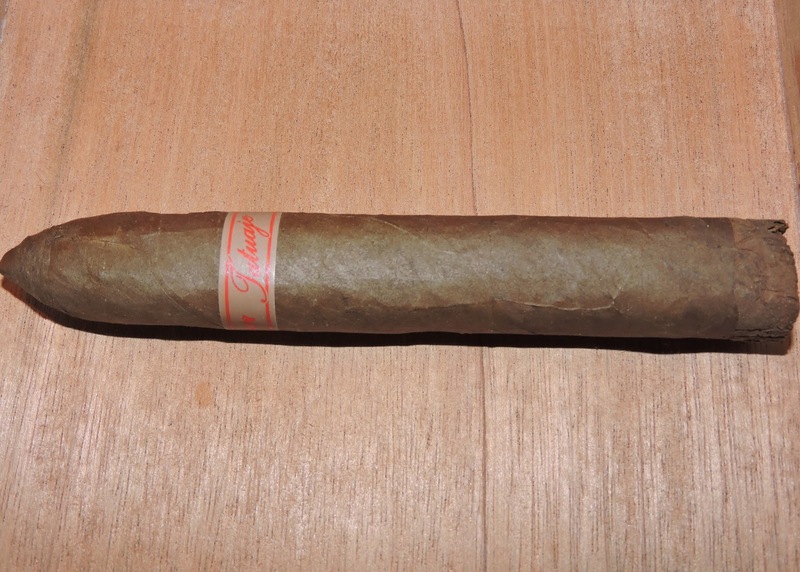 Depending how you look at this cigar, it can be considered either a shorter version of Tatuaje – The Wolfman or a thicker version of the Little Monsters Tatuaje Wolfie cigar.. When the original Wolfman was released in 2011, it finished as the Cigar Coop #11 Cigar of the Year. While I wouldn’t categorize the Tatuaje Wolf as one of my favorite Pudgy Monsters, it still is a very good cigar – just one that has been up against some good competition included in the sampler. Of all of the Tatuaje Monsters / Little Monsters / Pudgy Monsters releases, the Wolf / Wolfie / Wolfman blend is the only one to feature a Ecuadorian Sumatra wrapper. For completeness we include all of the vitolas for the Wolf / Wolfie / Wolfman blend. Each of these cigars is a box-pressed torpedo with an unfinished foot. I found the Wolf’s wrapper to be very similar to the other vitolas of this blend. The Ecuadorian Sumatra wrapper has a medium brown-bag color with some dark spots. There is a slight bit of oil on the wrapper, but I wouldn’t categorize it as overly oily. The wrapper has a few veins. The color and texture of the wrapper do a good job at hiding the wrapper seams. The foot contains a “shag” that exposed the filler and binder (thus the “Wolfman” effect). The band is based on the standard “Tatuaje” scripted logo. The script font is an orange-red color on a pewter colored background. To the left of the “Tatuaje” scripting is the text “PUDGY” in the orange-red font. To the right of the scripting” it says “MONSTERS” in the orange-red font. To the far right is an orange-red Tatuaje “Tattoo” stamp. Prior to lighting up the Tatuaje Wolf, I went with a straight cut to clip part of the torpedo tip. I cut about 1/3 of the tip to still allow some tapering to occur on the draw. After clipping the tip, I moved on to the pre-light draw stage. I detected notes of cedar, coffee, and leather on the dry draw with the cedar notes definitely prominent. Overall I was pleased with the pre-light draw of the Tatuaje Wolf. At this point i was ready to light up the Tatuaje Wolf and see what this size would have in store. The start to the Tatuaje Wolf was very similar to the Wolfie and The Wolfman. I was treated to a spice blast that consisted of a mix of cedar spice and black pepper. Once the cigar burned through the unfinished portion of the cigar, a coffee note and a slight orange-citrus note emerged. The orange-citrus became primary. There were times this citrus had a bit of an astringent flavor, but it still had some sweetness. I also detected some grass in the background. Meanwhile on the retro-hale I picked up a combination of the cedar and pepper notes. By the later part of the first third, the coffee, orange citrus, and cedar notes were up front. I detected the pepper and grass in the background. The astringency from the citrus notes had worn off. I also picked up a very distant cream note and categorized this as more of a tertiary flavor. This continued into the second third. On the last third of the Wolf, much of the sweetness coming from the orange-citrus had dissipated. The cedar notes in the forefront became more of a classic wood note. By this point the grass and cream notes had also dissipated. There was also an increase in the pepper spice. This is the way the flavor profile held until the end. The resulting nub was soft to the touch and cool in temperature. For the most part, the Tatuaje Wolf delivered a good burn. While there was some curviness to the burn line, I didn’t find this a burn that was in danger of canoeing or tunneling. The resulting ash was light silver in color. The early stages of the smoke had some flaking – most likely due to the unfinished foot. Once the burn reached the wrapper section of the cigar, the Wolf was void of any flaking. The burn rate and burn temperature were ideal. I found the draw to the Tatuaje Wolf to be excellent. The draw was neither tight nor loose. Normally I am not a fan of the way torpedoes draw, but puffing on the Wolf proved not to be a chore – and it was enjoyable from start to finish. The tapered tip where the cut was made never got overly soft. For the most part I have found the Tatuaje Wolf to be in the range of its thinner sibling, the Tatuaje Wolfie (and a full size Wolfman with age). From a strength perspective, this is not going to be a nicotine bomb. I assessed the Tatuaje Wolf as being a medium strength cigar. Meanwhile I found the depth of the flavors to fall into the medium to full-bodied range. In terms of strength versus body, I also found the Wolf to be consistent with the Wolfie and Wolfman – namely a cigar that emphasizes body over strength. The flavor or “orange” has been a common thread across the Wolfman / Wolfie / Wolf line. With the original Wolfman I had gotten a nice orange citrus sweetness. With the Wolfie, it leaned more of a bitter orange peel quality. The Wolf seemed to lean closer to the orange sweetness, however there was still a little bit of an astringent quality early on with this cigar, so I’m inclined to think a little more time in the humidor will take care of that. Still, this is a cigar that is ready to smoke now – and it is a flavorful smoke. This is a cigar I’d recommend to either a novice or experienced cigar enthusiast. As for myself, right now it is worth a five pack in my book.